In his book the Sales Acceleration Formula Mark Roberge shares his equally unconventional and impactful vision on B2B sales as a discipline. That vision is threefold: he wants salesprofessionals, CXOs and entrepreneurs first of all to realize that sales can be data-driven and predictable. Secondly he stresses the need for sales discipline to radically change. And thirdly, the perception of sales should and will improve as a result. As the Chief Revenue Officer at HubSpot, Mark Roberge depicts five formulas in modern B2B sales that better enable B2B companies to realize growth. 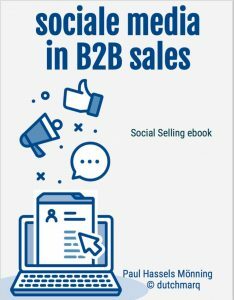 Delivered in an accessible style, this book also paints the story of SaaS-pioneer HubSpot in inbound marketing and sales: the Boston-based firm grew from $0 to $100 million in revenue under Roberge’s leadership. In yesterday’s Financieel Dagblad-column Annet Aris – Fontainebleau professor of digital strategy – describes the imminent digital disruption’s impact on business-to-business. Sofar says Aris, digital impact in B2B has been much more limited than in B2C. B2B companies in her opinion are slower to change their behavior than individuals. And due to patents and intimate buyer relationships, B2B products allegedly are better protected against newcomers. Homo economicus does not exist. The human species – in B2B marketing too – is being driven by emotions. Neuroscientists and behavorial economists agree that man makes up to 99% of his (or her) emotions subconsciously, from the instinct. ‘The human brain hasn’t had a major software upgrade for the last 50,000 years’, said Peter Diamandis a few weeks ago at the Singularity summit in Amsterdam. B2B Marketing Conference: stop underestimating emotion’s key role in B2B! November 5th the B2B Marketing Conference took place in London (UK). Well over 200 marketeers gathered to discuss the pivotal role emotion plays in business-to-business. Great to see 200 peers agree to this fundamental insight, which is too often still overlooked or underestimated in B2B. This could well be one of your most promising new business resolutions. https://dutchmarq.nl/wp-content/uploads/2014/11/many-emotions-in-b2b.gif 140 670 Paul Hassels Mönning https://dutchmarq.nl/wp-content/uploads/2018/12/logo_DQ_kleur_2018-1.png Paul Hassels Mönning2014-11-11 13:05:002018-11-30 18:09:10B2B Marketing Conference: stop underestimating emotion's key role in B2B!